Duffy’s Cut victim John Ruddy, late of Chester County, is to be buried after services March 2 in County Donegal, Ireland. Ruddy was one of up to 57 Irish immigrants who died of cholera and probable mob violence at an East Whiteland railroad construction site known as Duffy’s Cut. Ruddy and the others are believed to have died nearly 181 years ago in the last two weeks of August 1832. Ruddy was 18. His are the only remains thus far identified from an incident that was successfully hidden from the general public until recent years. Professor William Watson of Immaculata University released details of the funeral arrangements. Services are set for 3 p.m. at Holy Family Church in Ardara, Donegal. Burial will be in the church cemetery. A week or so I happened to be passing by the Duffy’s Cut historical marker (I got a historical marker approved a few years ago and it is a lot of work to get one of them) and stopped to photograph it. Given the clouds of mystery and intrigue still surrounding Duffy’s Cut, I think the foggy afternoon was perfect. I also think that given the development occurring in Malvern (borough and East Whiteland) by developers who don’t truly give a rat’s fanny about the area, the history, or the current residents (they care about building and selling projects) it is also appropriate to remember the history. You can never truly move forward into the future if you can’t honor the past, or that is just my opinion as a mere mortal and female. Duffy’s Cut is a big deal. What was Duffy’s Cut? MALVERN, Pa.—Frank and Bill Watson recently led a group hoisting shovels and pick axes into a wooded hollow here in Philadelphia’s suburbs. “Let’s find some bodies,” said Bill Watson, a professor of history at nearby Immaculata University. Two children playing nearby scampered away before the men led by the Watsons—twin brothers and historians—started chipping away at a hillside hemmed in by two housing developments and busy railroad tracks. The Watsons are on a macabre mission that began with a file of railroad company documents left behind by a grandfather and curiosity about what exactly happened at this spot—known as Duffy’s Cut—nearly 180 years ago. This much is clear: Nearly 60 Irish laborers died here in 1832 as they built a land bridge for what became the thriving railroad that lent its name to Philadelphia’s affluent Main Line suburbs. Their bodies were believed to be buried in a mass grave next to the railroad line, used today by Amtrak and local commuter trains. Tales of ghost sightings nearby were passed down through generations of area residents. Cholera seemed the most likely culprit. Newspaper reports from the time reported that the disease killed several of the laborers at Duffy’s Cut. And an 1833 letter written by a superintendent of a precursor of the Pennsylvania Railroad said the contractor who hired the workers, Philip Duffy, lost “nearly one half of his men” to cholera. But early in their research, the Watsons began to suspect there might be more to the story…. In 2009, they began finding skeletal remains of at least four people. While many questions linger, the Watsons have become convinced at least three of them didn’t die of cholera. One skull has holes with traces of lead on the edges, indicating a bullet’s entry and exit wounds, as well as a narrow slit that appeared to be delivered by an axe or hatchet. Another has a compression fracture suggesting it was caused by a blunt object. The third had dents in the skull indicating violence…. The work at Duffy’s Cut has received media attention in Ireland, and the Watsons have told the story to Irish heritage groups here. Michael Collins, the Irish ambassador to the U.S., has visited Duffy’s Cut twice. Unfortunately as of October 31, 2011 from what I can tell the archeological digs stopped. It seems AMTRAK had enough. I am not surprised. I made a bit of a project out of them once upon a time and they are souless money grubbers who are horrible neighbors, charge ridiculous amounts for often dirty, smelly trains and piss poor service, so why would I be surprised history was also not their forte? The short answer is I am not. I have not found anything more recent than a 2012 YouTube video put out by The University of Pennsylvania. Of course one would think our Congressman Jim Gerlach and our US Senators, State reps, State Senator Any Dinniman, and Gov. Corbett might show an interest in getting whatever that is left to be done gets done? But until they do, I daresay the ghosts of Duffy’s Cut will wander. 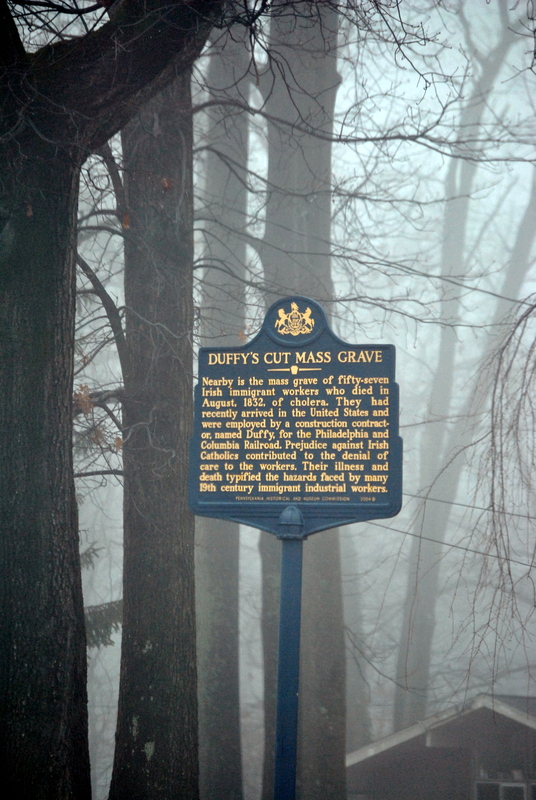 The dig for Irish remains at Duffy’ Cut in Pennsylvania has come to an end. It has been located 30 feet underground but too near to an existing Amtrak track to unearth it. It is said to hold the remains of up to 57 Irish emigrants from Donegal, Derry and Tyrone. The Watsons, believe most of the Irish were likely victims of lynch mobs driven by anti-Irish sentiment which was widespread at the time. The discovery of the mass grave came when geophysicist Tim Bechtel used updated equipment electrical imaging and seismic surveys, to discover the mass grave 30 feet below the surface. It’s also on Amtrak property. They will not permit any digging because of its proximity to the tracks, spokeswoman Danelle Hunter told Associated Press.…The mass remains are of Irish immigrants, mostly from Donegal, who were building the railroad near Philadelphia when they all mysteriously died…. Frank and Bill Watson with the help of volunteers and archaeologists proved via DNA and testing that most of the Irish had been murdered and did not die of cholera. “Since the beginning, we have seen it as our job to get their story out of folklore and into actual history, and we hope we have done that,” Bill Watson told Associated Press. A local monument stated the men had died of “black diptheria” in 1834 but it is known they died two years earlier. Soon after they started digging they found the remains of six people and a nearby shantytown. University of Pennsylvania anthropologist Janet Monge found proof of savage violence done to the remains including a bullet wound to the head of one of them. Many locals had been sceptical that anything would be found. East Whiteland Township Manager Terry Woodman told AP. The rest who were killed were ordered buried in a mass grave and their shantytown burned to the ground. One victim was identified victim as 18-year-old John Ruddy, based on his bone size and the passenger list of a ship that came from Ireland to Philadelphia shortly before the men died. The brothers plan to bury the remains found in a suburban Philadelphia cemetery around St. Patrick’s Day, March 17. Dennis Downey, a history professor at Millersville University, said the work done has been invaluable. So Malvern, as you look at the developer tarting up one end of the town to sell his project, remember what happened in the East Whiteland side of Malvern. Here’s hoping some day the dead there can all rest. They certainly didn’t get what they deserved coming to America looking for honest work. This entry was posted in people and tagged amtrak, chester county pa, Duffy's Cut, East Whiteland, Frank and Bill Watson, History, Immaculata, IrishCentral, Jim Gerlach, Malvern, Tom Corbett, wall street journal by carla. Bookmark the permalink. just saw the Nat Geo program on this. Thank you for trying to honor the lives of these men. How sad they never had a decent chance.